where denotes the Pochhammer symbol given by and . In diverse areas in applied mathematics and mathematical physics, generating functions play an important role in the investigation of various useful properties of the sequences which they generate. These are used to find certain properties and formulas for numbers and polynomials in a wide range of research subjects such as modern combinatory. One can refer the extensive work of Srivastava and Manocha 3 for a systematic introduction to, and several interesting and useful applications of the various methods of obtaining linear, bilinear, bilateral or mixed multilateral generating functions for a fairly wide variety of sequences of hyper-geometric functions and polynomials in one, two or more variables, among much abundant literature. In fact, a remarkable large number of generating functions involving a variety of hyper-geometric functions have been developed by many authors (for example 4, 5, 6, 7 and the related references therein). 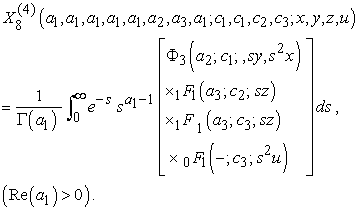 Here, we use the integral representation of the hyper-geometric function of four variables o obtain new generating functions involving Exton’s functions ,, , of three variables, the Lauricella functions of three variables and the quadruple functions itself. Some special cases of the main results here are also considered. Now, use of (2.17), (2.18) and (2.19), in above equation and then simplified with series manipulation completes the proof of relation (2.7). From the relations (2.17) to (2. 24), one can easily obtain the other generating functions. A special case of (3.13) when yields the well-known results (see 8). Based on Laplace integral representation of the quadruple function defined in 1, we introduce new generating functions for the function involving triple hyper-geometric functions. Some particular cases and consequences of our main results are also considered. We conclude this investigation by remarking that the schema suggested in the derivation of the results in this work can be applied to find other new generating functions of other four variables hyper-geometric series and study their particular cases. Bin-Saad, Maged G., and Jihad Ahmed Younis. "On Generating Functions of Quadruple Hypergeometric Function ." Turkish Journal of Analysis and Number Theory 7.1 (2019): 5-10. Bin-Saad, M. G. , & Younis, J. A. (2019). On Generating Functions of Quadruple Hypergeometric Function . Turkish Journal of Analysis and Number Theory, 7(1), 5-10. Bin-Saad, Maged G., and Jihad Ahmed Younis. "On Generating Functions of Quadruple Hypergeometric Function ." Turkish Journal of Analysis and Number Theory 7, no. 1 (2019): 5-10.